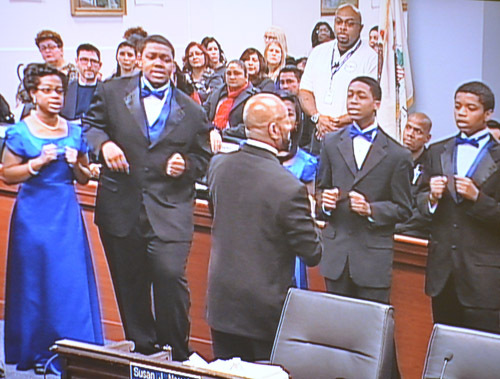 The December meeting of the Chicago Board of Education on Wednesday, December 18, 2013, at 125 S. Clark Street began with festive holiday performances by Kenwood Academy and Lane Tech High School. Kenwood Academy guys in tuxes trimmed with blue satin and girls in long blue satiny gowns sang for the audience in honor of Nelson Mandela. Then student musicians performed "Rondo" on stringed instruments. After that, The Lane Tech Jazz Combo played "Have Yourself a Merry Little Christmas," accompanied by a female soloist, and finished with "Cold Duck Time" by Eddie Harris. 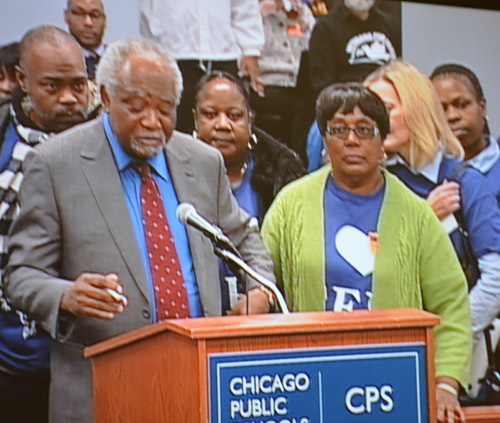 For thousands, the most shocking moment during the December 18, 2013 meeting of the Chicago Board of Education came when Congressman Danny Davis took the podium to betray decades of friendships and political allies by announcing that he was supporting the production of another union-busting charters school on Chicago's West Side. In a rambling five-minute orgation, Davis told the Board that he had always supported the public schools and that he loved the Chicago Teachers Union and that he had been a union member -- but instead of fixing the real public schools of the Aistin community he would prefer that a local community center be rewarded with a charter school charter and millions of dollars in public money for additional privatization. Before the meeting was over, many of Davis's former allies were branding him a traitor and preparing for the future. Substance photo by George N. Schmidt.Board President David Vitale thanked them on behalf of all the present Board Members: Dr. Henry Bienen, Dr. Mahalia Hines, Board Vice-President Jesse Ruiz, Andrea Zopp, Deborah Quazzo, and Dr. Carlos Azcoitia, and Honorary Student Board Member Ashley Gordan. All of the Board members, and "Chief Executive Officer" Barbara Byrd Bennett, are appointed by Mayor Rahm Emanuel. After the holiday music, Chief Executive Officer (CEO) Barbara Byrd-Bennett also expressed her appreciation and said she almost felt as if she should sing her report. But she didn't do it. In her report, Byrd-Bennett spoke of 60,000 students who are not currently enrolled. She said that three new "engagement centers" had been opened, at Garfield Park, Roseland, and Little Village. She talked about her "five-year plan" and the 15,000 students who would be served. She also claimed for everyone that the currently the Board is operating in more space than needed at 125 S. Clark. She said the current Central Office space was "under-utilized" and in a half-empty building. The plan is to move Central Office headquarters to a location, owned by Sears Holdings, nearby on North Dearborn Street. None of the members of the Board of Education challenged her claims about 125 S. Clark St., or her proposal to move the central office again. None of the Board members noted that the central office had dispersed many of the central functions across the city, while eliminating or privatizing those that remained at enormous cost. 26th Ward Alderman Roberto Maldonado was joyous as he spoke to the Board knowing that the deal was done and that the change at Ames Middle School into the "Marine Military Academy" would take place. During the struggle over the future of Ames, Maldonado had helped get the name changed from "Military Academy" to "Leadership Academy," but nobody at the December 18, 2013 meeting of the Chicago spoke about the fact that every child at the school would be wearing a U.S. Marine Corp uniform by two years from now. Substance photo by George N. Schmidt. Chief Counsel James Bebley then discussed the CPS investment policy that would be voted on in closed session and said that the Chief Financial Officer (CFO) recommends approval. 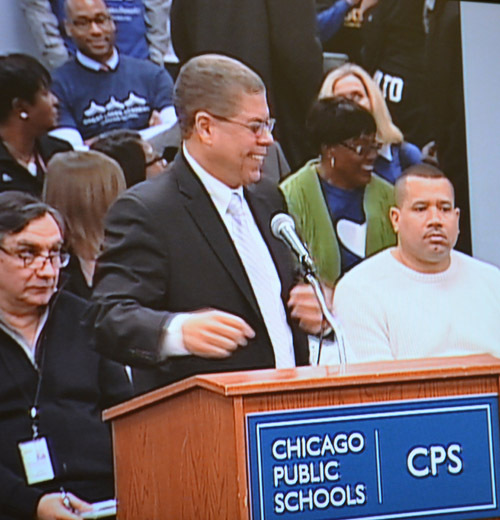 As usual, the Chief Financial Officer was not seated among the top officials of the Chicago Public Schools, while the "Chief Administrative Officer" (who usually gives the financial reports) was seated a few feet from Barbara Byrd Bennett. Public Participation again was abbreviated because of the hostility of President David Vitale and the Board to actual public participation at the Board's lone public meeting each month. As usual, anyone who wishes to testify had to sign up on line for one of the 60 slots for speakers, and the entire process was terminated after 60 had signed up within 32 minutes of the opening. As usual, Vitale reminded everyone that Board members are available each month to meet with members of the public. He never reports on whether anyone comes to speak with the Board, or what the discussions are about. An appointment can be made by calling 773-533-1600, he said. The next Board meeting will be held on Wednesday, January 22, 2013, Board Secretary Esela Belran announced. Sign-up for this meeting will take place starting on Monday, January 13, at 8 a.m. and ending on Friday, January 17, at 5 p.m. -- or, Beltran said, when all 60 public participation slots are filled. Singers from Kenwood HIgh School sang in honor of Nelson Mandela. No one at the Board meeting mentioned the fact that the current Chicago Board of Education has been promoting educational apartheid in Chicago, firing black teachers as fast as they can close black schools, and refusing to hire black administrators from Chicago -- preferring cronies of Barbara Byrd Bennett (most of them white) from other states. Substance photo by George N. Schmidt.Beltran didn't note that for the December meeting, nearly half of the sixty slots for the public had been monopolized by just one group. The Board of Education's current practice is to stop allowing people to sign up to speak at the monthly meetings at 60. By signing up 28 people to speak on a single topic (see below), one group had forced out most of those who had wanted to speak. As Substance reported earlier, the sign-in time for December 2013 lasted all of 32 minutes. The meeting began with Aldermen and public officials. First to speak was 19th Ward Alderman Matthew O'Shea, on behalf of Morgan Park High School and the wall-to-wall expansion of the Baccalaureate program being explored by the parents and the community. O'Shea said the school had been without a principal for 21 months and now Dr. Carolyn Epps, the new principal, has helped to "turn the school around." O'Shea said that expanding the International Baccalaureate (IB) program would be the best way to achieve an atmosphere where children are expected to go to college. He spoke of a partnership with St. Xavier University which he claimed would provide development, support "dual enrollment programs", service trips, and more. He promised that Morgan Park High School will be a "Level One High School" and when that happens and Dr. Epps and I will be back to thank you. O'Shea also listed a number of bureaucrats for individual thank yous. 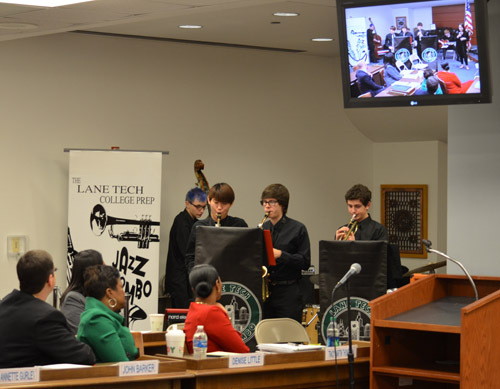 The Lane Tech High School Jazz Combo performed some holiday music for the Board of Education. Seated watching the musicians are (left to right) John Barker, Arte Duphelia, Denise Little, and Tracy Martin Thompson -- all among the highest paid administrators in America's third largest school system. Only Little has taught for even one day in a Chicago classroom such as the one in which the Jazz Players learn daily. All the others were hire from out of town (Barker and Martin-Thompson) or because the Board feels that an MBA vetted by the Broad Foundation (Duphelia) is more qualified to run Chicago's schools than anyone with classroom teaching experience. Substance photo by George N. Schmidt.Next to speak was 43rd Ward Alderman, Michelle Smith, representing the Lincoln Park neighborhood. Smith spoke of the annex at Lincoln Elementary that CPS was going to build to "relieve overcrowding". Smith continued the in-fighting that had characterized the push to get millions of dollars for the school's expansion. Smith said she was embarrassed and astounded by those against the annex and expansion. She claimed it will get children "out of coatrooms and hallways" and into classrooms. She said that traffic issues and drop-off issues will be worked through. Then began the aldermanic speakers, who are allowed to bump to the front of the line at each Board meeting if they are standing with the aldermen who praise the Board (the same is not afforded to aldermen who rise to oppose Board policies, Substance notes). Mark Stephen (not signed up to speak) then said that he and his wife and son have lived in the community "around three years." Because of the annex, he said this will keep us here in the neighborhood, along with other parents of young children. The Lincoln annex will allow surrounding schools, LaSalle, Alcott, and Newberry to keep their highly-coveted magnet seats. The privileged history of the community, which contains more magnet schools in one square mile than the Austin community has in the largest community of the city, was ignored. Trish Juarez, who said she is the parent of two primary students at Lincoln School, wants the Board to continue supporting traditional neighborhood schools. She said that Lincoln School has a capacity of 630 students, a current enrollment of 817, and is expected to have 828 after January 1. She added that new construction in the area will produce one thousand plus new residents. Next came the controversial military expansion. Following the Lincoln annex supporters and their alderman, came the military expansion supporters, and their alderman, 26th Ward Alderman Roberto Maldonado spoke in favor of the Board voting to open Marine Military Academy. He mentioned that Ames Middle School continues to be under-utilized with only 52% of the students zoned to attend Ames who choose to attend Ames. He added that Marine Military Academy will not be a training ground to send children into the military and that the school does not promote militarization. He remarked that there had been a 0% drop-out rate for the class of 2013. Alderman James Balcer of the 11th Ward said he supports Alderman Maldonaldo. He stated that he served in the Marine Corps and Vietnam. He mentioned that he and Alderman Maldonado may disagree on other issues, but he supports Alderman Maldonado on this issue. He added that he was on the ground floor at Bronzeville Military Academy. He remarked that Reserve Officers Training Corps (ROTC) is a good program. He also said that he has a nineteen-year old son and said if his son wants to join the military, he supports him. He ended his speech with the Marine motto, "Semper Fidelis," (Always Faithful). The Reverend Walter Coleman, who signed in as the pastor at Adelberto Methodist Church in Wicker Park and Little Village, said that the Marine Military Academy is a "student-run institution" -- and that students "bring people in. "He said that Ames Middle School was created because of overcrowding and that the need no longer exists since the community is no longer overcrowded. He continued to speak for way over the two-minute public participation limit without being told to stop by Board Secretary Estela Beltran. After Coleman's claims had been spoken, a parent spoke in Spanish spoke (and translation was provided by Emma Lozano, who was supposed to be speaking). The speaker, who was not asked to identify herself, said she was a parent of two at Marine Math and Science, and was pleased and satisfied with the school. She said her son "fell in love with the uniform", has improved academically, has good attendance, and shows responsibility at home. Next to speak was Joline Lozano, who identified herself as "a community member." She continued the praise for the militarization of Ames The Board program said she had an issue with Marine Academy merging with Ames School, but when she spoke she said the opposite. After she spoke, U. S. Representative Danny Davis shocked many who had known him for decades by coming out public for charter schools without mentioning the Board's sabotage of the real public schools in the Austin community. For nearly five minutes, Congressman Davis spoke in favor of the "By the Hands" organization which wishes to establish a charter school in the Austin neighborhood. He mentioned that he was a member of the Chicago Teachers Union (CTU) and that he had been a Chicago Public Schools (CPS) teacher for six years at "a special school for disadvantaged children." He also said that he had followed Rev. "Slim" Coleman and had gone to Harvard, named his church affiliation, said told the Board he taught Sunday School at the age of 15. He added that faith was often an integral part of a student's desire to learn, and mentioned that he had seen fewer African-American teachers in the last ten years without noting that the decline in African American teachers had been done by the Board precisely through the expansion of charter schools and the sabotage of the city's real public schools. Ruth Kimball, founder of a wholistic services network in the Austin community, spoke of a book she meant to bring to the Board meeting, "Will They Lead." After the Board had allowed nearly 15 minutes so that Alderman Roberto Maldonado and supporters of the Marine Military Academy could speak in favor of the destruction of the current Ames Middle School, supporters of Ames took the floor and refuted every claim made by Maldonado and the others. Above, Delia Bonilla tells the Board the community, parents and students do not want the disruption that will attend the changing of Ames into a "Marine Leadership Academy" school. Substance photo by George N. Schmidt.Next, speakers in favor of Ames spoke. Delia Bonilla (in translated Spanish) asked that Ames be kept a community school. She said that we are here because we are upset, signatures have been impounded. She mentioned that she was here representing all Ames parents who do not get intimidated by Alderman Maldonado. She added that Marine was not welcome in the community, it should look for another place, and the Board should listen to the Ames community and not politicians like Maldonado. She informed the Board the Ames has many programs, today Maldonado brought lots of people who do not live in his ward, the students are upset, and she asked the Board to vote NO to Marine Military Academy at Ames. Then Emma Segura played a recorded phone message and remarked that Ames parents never heard about community meetings held by CPS. She said the parents were not informed that the community meeting was happening until sign-ups by the Board. Board Member Dr. Henry Bienen expressed concern with the accuracy and integrity of the survey and asked for verification of all signatures, in order to be fair. 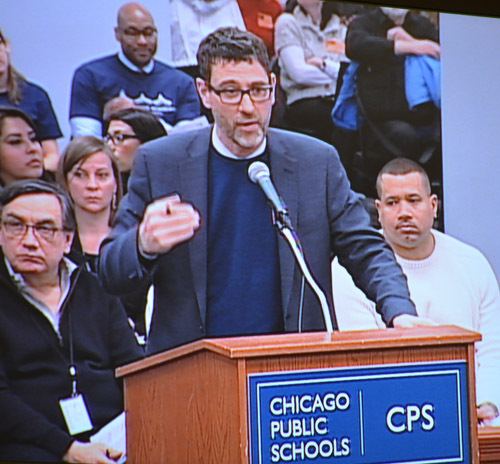 Following this, CTU Vice-President Jesse Sharkey spoke against CPS plans for changes at Ames. He also said that last year four schools were closed in Austin, but now a new (charter) school is being planned in Austin. He compared the situation to Imelda Marcos (of the Phillipines) who had a shoe addiction. He remarked that the Board wants new schools that can't be justified. He asked that the Ames decision be delayed. 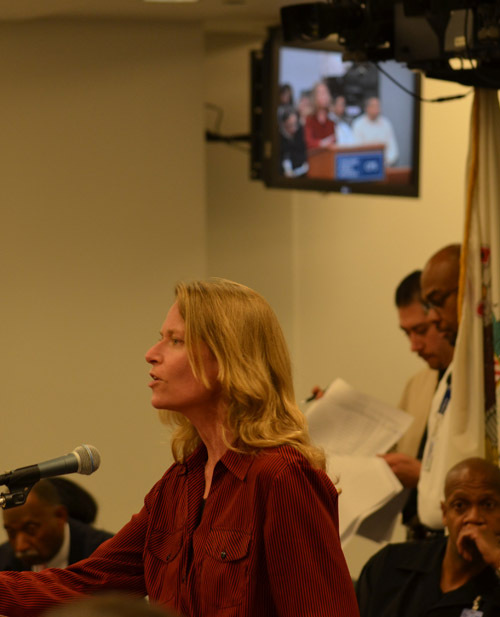 Chicago Teachers Union Vice President Jesse Sharkey told the Board that the continuing expansion of charter schools was like Imedla Marcos continuing to expand her shoe closet, while claiming she was kicking the shoe-buying habit. She stopped buying new and never-to-be-worn pairs of shoes, Sharkey said, until she saw a new pair she couldn't resists. And, Sharkey said, the Board has never met a charter school it couldn't resist. Substance photo by George N. Schmidt.Next, Mariame Kaba, of Project NIA, said she was here to report back on the progress we've made in meeting with Jadine Chou and John Barker of the Board. She spoke of the connection of race and gender, etc., to suspensions and expulsions. She asked for an interruption to the school to prison pipeline. She asked for a yearly summit with CPS. Following her were speakers for the Healthy Schools Campaign. Rochelle Davis spoke of the pros and cons of the Healthy Schools Campaign. 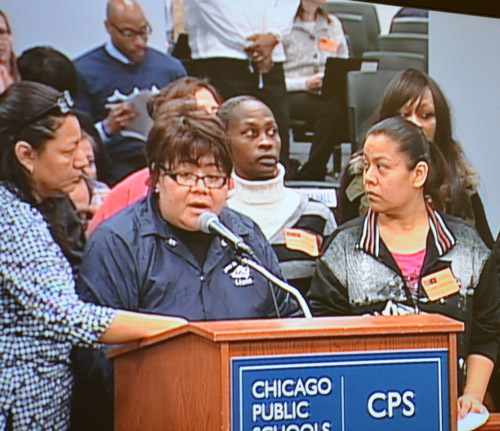 She said that CPS wants to pull Physical Education (PE), but she disagreed saying, "All students should have daily PE." Lorena Jasso, of Parents United for a Healthy School Campaign, spoke of the 300 parents and 7000 petitions in support of daily PE. She stated that healthy student are better learners and that a large percentage of students are overweight or obese. Next, Andrea Mularczyk, of Payton High School, stated that the Illinois School Code provides exemptions in PE for certain students. She felt that the principal should be able to exempt students taking Advanced Placement (AP) courses for admittance to top universities. Board President Vitale said that there would be no more waivers, the policy has been deferred, and CPS supports the new policy. Mary Rawlins, of the "Be the Change" Charter School (BCCS), spoke about their charter school proposal, in the McKinley Park neighborhood. Speakers against the expansion of Lincoln Elementary spoke next. Joy Wingren, of Lincoln Elementary, remarked that Alderman Smith didn't stick around for our comments. She said she was puzzled by Alderman Smith's comment that we embarrass her. She said signatures that had been presented were questionable, we have collected petitions against this plan, the alderman hand-picked people and admitted it, and there are grounds for impeachment of this alderman. She added that she had 12 more points she wished to mention, but the points were in the packet she provided to the Board. She remarked that we do not want 18 million dollars, use it for Ames or Canty. Lisa Barrow, spoke against the Lincoln Plan. She asked that the annex be put at LaSalle. She said there had been no input from the community and asked that the vote be delayed for three months. Charter school parents returned to the podium to tell the familiar salvation story that is routine for parents promoting charter schools. The story goes simply as follows: According to the parent, the real public school did something bad to the child, and the child found salvation in the charter school. Often the parent doesn't even identify the real public school where the terrible things supposedly happened, but in the next case she did. JoMichelle Hale told of her child's struggles in reading and math at Ray School. She said he was a hard worker, but the teachers were not very creative. After he went to Perspectives in seventh grade, she said he ended up on the honor roll the first marking period. His Cs and Ds became As and Bs. She asked for more high quality schools. Maribel Franzo also spoke in support of Perspectives School. She said her son improved after transferring to Perspectives. She said she supports high-quality charter schools. Stacy Babich, of Canty School, said the community has been waiting for upgrades for 15 years. She said the school was built for 500 hundred students and is now 150% overcrowded. She stated that they have no lunchroom, no kitchen, the library is used as a classroom, and that subjects are taught from carts. She added that today there was heat and air-conditioning in other areas of the building. She said that if there is 18 million for Lincoln School, there should be 18 million for Canty. She also said that allowing the aldermen to go to the front of the line was not fair. Arnold Stieber, a Veteran for Peace, said he had served in the infantry in Vietnam. He stated that he is against the militarization of CPS students. He remarked that the military is being used as a panacea and is teaching violence. Next, two persons spoke in favor of the Great Lakes Academy Charter School. Darrell Trusty spoke of the proposed school's 2014 opening and high-quality school options on the south side of Chicago. Laura Morgan also spoke in favor of this charter school. George Schmidt, who currently has two sons in CPS -- and one who designed the Substance News website after attending a CPS school and then becoming an engineer in the San Francisco area -- spoke about the current CPS schools calendar. He told the Board that in Arne Duncan's time, the schools calendar and directory had more information than it does today. He said that the public schools calendar no longer lists schools. He added that it's because those schools will be destroyed in a few years. When asked by Board Secretary Estela Beltran to please conclude, he replied "I don't think so. You gave five minutes to Reverend "Slim" Coleman." He went on to say that on page 22 in the calendar (July 2014), the page mentioned that students should become duct tapers and "duct doctors." He added that the Board now has a new policy of hiring people from outside the city and provided moving expenses for former CEO Jean-Claude Brizzard, current CEO Barbara Byrd-Bennett and thirty more. He received no response when he asked the Board members, "Any questions?" Marisol Diaz, of Peck School, then expressed appreciation for the full-day kindergarten and asked the Board if they could now provide a lunchroom and library. Sharon Schmidt telling the Board about the unanimous opposition to charter school expansion on the Northwest Side. Substance photo by George N. Schmidt.Following her, Sharon Schmidt of Steinmetz High School presented the Board with copies of the school newspaper, the Steinmetz Star. On the front page of the current issue, students wrote against charter schools that are planned near Steinmetz High School, which is not overcrowded, and across the street from Prosser Vocational High School. The charters would take students from existing schools. The students have also led protests. Next, Kelly Griggs and Joanna Brown spoke against the fingerprinting requirement process that is required for volunteers. Joanna Brown added that volunteers were not informed that they needed to be finger-printed and a lot of undocumented individuals do not want ti be finger-printed. She also spoke of the number of parents who had already been approved and the still larger number (69) waiting approval. She said she didn't know what the problem was. She added that 1000 parents want to be volunteers, but finger-printing is a problem, undocumented individuals are scared of finger-printing, and the previously employed background check worked. She was reminded that Board members have office hours once a month for meeting with individuals. Following this, several Board members commented on the various remarks that had been made by public participation speakers. Next, the Board went into closed session. Reading the Chicago Board of Education reports from SubstanceNews.net is almost like being there. My congratulations to Marybeth Foley for here excellent reports. Substance is fortunate to have here. A happy holiday season to all on the Substance staff.